“Texas House approves 2020-21 budget plan, with extra $9 billion for school finance, property tax relief” was first published by The Texas Tribune, a nonprofit, nonpartisan media organization that informs Texans — and engages with them — about public policy, politics, government and statewide issues. Some of the more contentious budget proposals floated by lawmakers never reached the floor. An amendment from state Rep. Richard Peña Raymond, D-Laredo, for example, would have asked members to vote on the issue of across-the-board pay raises for public school teachers. Such a proposal has divided the Legislature this session, with Lt. Gov. Dan Patrick’s Senate in favor and much of the House opposed. Raymond withdrew his amendment Wednesday evening, saying he planned to bring up the issue again when the House debates its school finance bill. Debate on HB1, the House state budget bill, continues into its 12th hour as State Rep. Chris Turner, D-Dallas, shows the strain of a long night. March 27, 2019. Photo by Bob Daemmrich for the Texas Tribune. A proposal from state Rep. Mayes Middleton, R-Wallisville, to prohibit disaster recovery dollars from benefiting noncitizens and “illegal aliens” was quietly withdrawn after sparking controversy earlier this week. Across the aisle, state Rep. Jessica González, D-Dallas, withdrew her amendment that would have required Gov. Greg Abbott’s office to prepare a report on domestic terrorist threats posed by white supremacists. Bonnen worked behind the scenes in the days preceding the vote, House lawmakers said, in the hopes of avoiding the discord that has erupted during the chamber’s marathon budget debates in past sessions. On Tuesday, top lieutenants for Bonnen met for a handful of informal gatherings to offer concessions in exchange for lawmakers dropping some of their more controversial amendments, according to people familiar with the meetings. The result was one of the shortest budget debates in recent memory. Lawmakers gave preliminary approval to the two-year spending plan minutes after the clock struck midnight. Under former House Speaker Joe Straus, lawmakers in 2017 and 2015 went home well into the morning, after several explosive exchanges between Straus’ allies and the chamber’s hardline GOP membership. In an earlier dustup just before 2 p.m., state Rep. Sarah Davis, R-West University Place, who led the House budget negotiations over health and human services programs, was seen in a heated exchange with state Rep. Jeff Leach, R-Plano. A few minutes later, Leach proposed an amendment that would allow Texas to expand Medicaid coverage for women up to a year after they give birth. 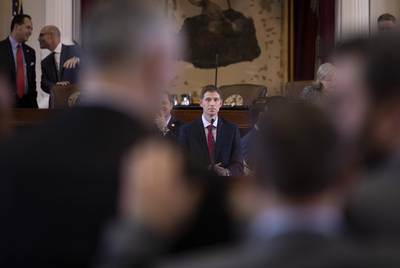 To cover some of the costs, Leach’s amendment recommended cutting $15 million from a program in Abbott’s office that reimburses film and video game makers who work in Texas. Extending postpartum Medicaid coverage “is simply more important and should be a higher priority” than the film incentives program, Leach said. Democrats gathered at the back microphone to oppose the motion, saying the funding should come from elsewhere. “I’m not going to agree to hypotheticals,” Leach replied. The amendment subsequently passed without a recorded vote after putting Democrats in the awkward position of voicing opposition to a Medicaid coverage expansion they otherwise supported. A more ambitious Medicaid coverage expansion, which would have provided publicly funded health insurance to low-income Texans under the Affordable Care Act, failed for a fourth legislative session. The Medicaid expansion amendment brought by state Rep. John Bucy III, D-Austin, was rejected with 66 votes in favor and 80 opposed. Still, Democrats saw some wins Wednesday. For example, an amendment by state Rep. Michelle Beckley, D-Carrollton, that would require the Department of State Health Services to conduct a study on vaccination rates among children at licensed child care facilities was approved in a 79-67 vote. Another successful amendment by state Rep. Chris Turner, D-Grand Prairie, directs the state to come up with a transition plan for when a pot of federal health care safety-net funding, known as the 1115 waiver, dries up in 2021 and 2022. Complicating budget negotiations was news of an updated property tax reform proposal, which was expected to be laid out in committee before the House convened but was instead postponed until after the budget debate. Debate over that updated proposal, which drew opposition from Democrats and hardline Republicans, carried over onto the floor as its author, state Rep. Dustin Burrows, R-Lubbock, met with committee members to discuss the high-priority legislation. The debate on the HB 1 ended with a procedural move spearheaded by Turner and Burrows to wrap up the remaining amendments and send them to the wish list portion of the wish list portion of the budget. That section of the budget, known as Article XI, is considered a graveyard for most line items. Passing an amendment to the wish list is “just a way to get you off the main,” state Rep. Yvonne Davis, D-Dallas, said in protest earlier in the evening, shortly before one of her proposals was shot down. The two-year budget wasn’t the only spending plan advanced by the House on Wednesday. Lawmakers also approved a $9 billion supplemental spending plan to pay for leftover expenses that aren’t covered in the state’s current two-year budget, mostly for Hurricane Harvey recovery and health and human services programs. A $4.3 billion withdrawal from the state savings account covers the largest share of expenses in the supplemental bill. Another $2.7 billion comes from the state’s general revenue, and $2.3 billion are federal funds. The legislation, Senate Bill 500, returns to the Senate, whose stopgap spending plan approved earlier this month carried a $6 billion price tag. Lawmakers in 2017 underfunded Medicaid, the federal-state health insurance program for the poor and disabled, requiring a $4.4 billion infusion of state and federal funds. The Legislature must pass the stopgap funding bill before the end of May if the Texas Health and Human Services Commission is to be able to pay health care providers on time. $2 million for state mental hospital improvements, which includes funding to plan the construction of new hospitals in the Panhandle and the Dallas area. 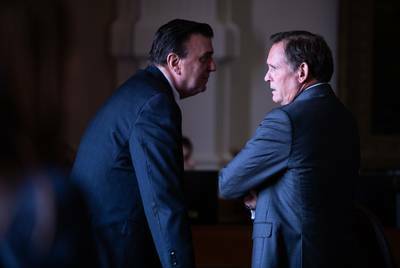 This article originally appeared in The Texas Tribune at https://www.texastribune.org/2019/03/27/texas-budget-house-2019/. The State Board for Educator Certification (SBEC) held ts first meeting of 2019 today in Austin. The board took action on several items, including a new superintendent certificate program to be offered by the Harris County Department of Education and approval of new standards for the English as a Second Language (ESL) supplemental certificate. The board also heard lengthy testimony on the upcoming EdTPA performance-based assessment pilot included within the Teacher Certification Redesign plan, which led to a discussion of concerns among the majority of the board. ATPE Lobbyist Andrea Chevalier attended today’s meeting and will be posting a full wrap-up of the discussions for our blog in the coming days. The Teacher Retirement System (TRS) Board of Trustees also met this week. For highlights of the board’s discussions, check out this blog post from ATPE Senior Lobbyist Monty Exter, who attended the meetings on Thursday and Friday, Feb. 21-22. The House Public Education Committee began hearing bills this week. Members considered bills on public education topics including pre-K class sizes, educator preparation, assessment, and special education. ATPE Lobbyist Andrea Chevalier testified for the first time before the committee in support of a bill that would improve and pay for mentoring programs. ATPE supported seven out of the 11 bills on the agenda. For more on the hearing, read this blog post by Chevalier. On Wednesday, Feb. 20, the House Appropriations Committee’s Article III subcommittee met to continue its review of the state education budget. The subcommittee heard from te leaders of the Texas Education Agency (TEA) and Teacher Retirement System (TRS) before inviting stakeholders to weigh in on the topic of education funding. ATPE Senior Lobbyist Monty Exter testified about the need to prioritize funding for public education this session as well shoring up the TRS pension fund. Stay tuned to Teach the Vote for updates as budget talks continue this session. On Sunday and Monday, hundreds of educators will arrive in Austin for ATPE at the Capitol, our biennial legislative advocacy and political involvement training event. ATPE members will spend Sunday attending training sessions on the association’s legislative priorities and hearing from elected officials about efforts to reform the state’s school finance system, among other education issues. On Monday, ATPE members will visit with their legislators and watch the House and Senate in action. Also happening on Monday, the Senate Finance Committee will hold a public hearing on Senate Bill (SB) 3, which aims to increase funding for public schools and give teachers a $5,000 raise. ATPE State Vice President Tonja Gray will be giving invited testimony at the hearing. Follow @TeachtheVote on Twitter for updates on Monday’s hearing and watch for a full recap of the event next week here on our Teach the Vote blog. The Teacher Retirement System (TRS) board was in Austin for their regularly scheduled board meeting on Thursday and Friday of this week. The board kicked off its hearing with a resolution celebrating the life and service of Mike Lehr, former executive director of the Texas Retired Teachers Association with more than 50 years working as a public school educator or on behalf of active or retired public school educators. Also of note, TRS executive director Brian Guthrie updated the board on interactions TRS has had with legislators as a part of the ongoing legislative session. TRS recently presented on its general outlook and budgetary requests before both House and Senate budget committees as well as the House Pensions Committee. The agency will still have one more general presentation to the Senate State Affairs Committee, and then the agency role will shift to assisting lawmakers more behind the scenes. The remainder of the first day’s morning session covered topics such as internal staffing policy, customer service, and how the agency communicates with TRS members. Thursday afternoon the board underwent ethics training and had an in-depth discussion of healthcare and healthcare design related to the TRS-Care and TRS-ActiveCare insurance programs. The board’s Friday agenda focused on the TRS investment program, including the agency’s emerging manger program, a view of national and global financial trends, and TRS’s own strategic asset allocation. Those who are interested can watch an archive of the board’s Thursday meeting and Friday meeting.